Glaucoma is an eye disease where the fluid necessary for nourishing our eyes does not drain properly through the anterior chamber, the space between the cornea and iris, causing an increase in eye pressure and damage to the optic nerve. 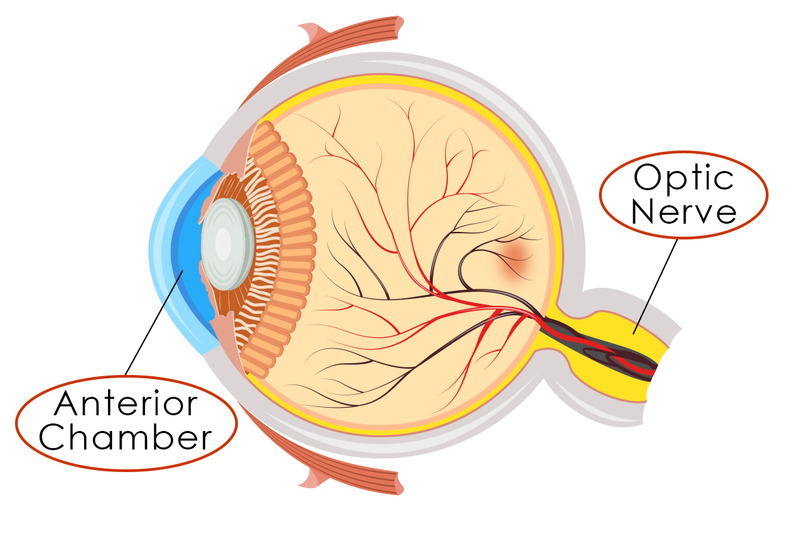 Much like a cable connected to your tv, the optic nerve is a “cable” of nerve fibers that sends images from the eyes to the brain. anterior chamber: The fluid-filled space between your cornea and iris. optic nerve: A nerve at the back of your eye that sends the images you see to your brain. 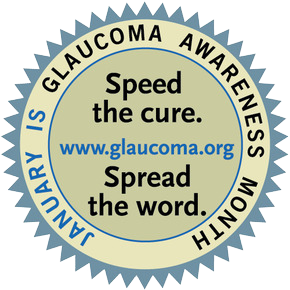 Glaucoma has few or no early symptoms and causes irreversible vision loss. As much as 40 percent of vision can be lost before you notice significant changes in your sight.1 Damage to the optic nerve gradually causes blind spots and affects peripheral vision (side vision) which can often go unnoticed. By the time you notice changes in your vision, the disease has already progressed. African American or Hispanic Ancestry: Open-angle glaucoma is five times more likely among African Americans and Hispanics compared to Caucasians. African Americans are susceptible at a younger age and the disease has a more rapid course. Elevated Eye Pressure: The higher the intraocular pressure (IOP), the more likely a person is to develop this disease. Thin Corneas: Past studies have shown people with a thinner central corneal thickness are more likely to develop open-angle glaucoma. Refractive Error: People who are farsighted or nearsighted may have an increased risk. Health History: Conditions such as diabetes, migraines, poor blood circulation, and uncontrolled blood pressure may contribute to glaucoma. Since there is no cure for glaucoma and vision loss cannot be regained, prevention through regular eye exams is the best defense against the silent thief of sight. A comprehensive vision exam is the only way to detect the disease since there are virtually no symptoms or pain associated with the early onset of the most common form of the disease. “Like other health screenings such as blood pressure, cholesterol, and blood sugar levels, your eye pressure needs to be checked periodically as well,” says Dr. Shawn Parker, the corneal and refractive specialist for Eye Care Specialists. Age 20-29: You should have an eye exam at least once during this period. If you are African American or have a family history you should have an eye exam every 3-5 years. Age 30-39: You should have an eye exam at least twice during this period. If you are African American or have a family history, you should have an eye exam every 2-4 years. Age 40-64: Every 2-4 years. Age 65 or older: Every 1-2 years. The earlier glaucoma is detected, the more vision will be preserved. The National Eye Institute projects that by 2030, 4.2 million people in the United States will have glaucoma.6 For healthy vision, know your family history, have recommended eye exams, and help raise awareness for this vision-threatening disease. Your eyes constantly create fluid that helps nourish your eye. Glaucoma occurs when this fluid does not circulate properly and cannot exit the anterior chamber, the front portion of your eye. When this happens a chain reaction occurs: Fluid builds up in the eye, eye pressure increases, high eye pressure damages the optic nerve. aqueous humor: A clear fluid that circulates through the anterior chamber providing nourishment and giving your eye its shape. 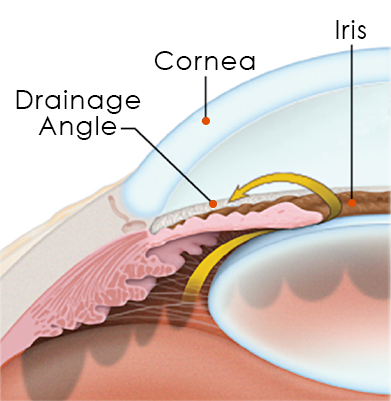 drainage angle: The area of your eye, where the cornea and iris meet, that allows aqueous humor to drain from the anterior chamber. 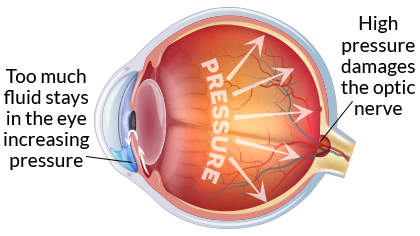 intraocular pressure (IOP): The fluid pressure inside your eye. trabecular meshwork: An area of cells in the drainage angle responsible for regulating the flow of aqueous humor through the anterior chamber. In the healthy eye, a clear fluid called aqueous humor flows through the anterior chamber, the front portion of your eye between the cornea (the clear front dome of your eye) and iris (the colored part of your eye). Differing from your tears, which lubricate the outside of the eye, aqueous humor delivers sugars, proteins, vitamins, and other nutrients to nourish the inside of your eye. 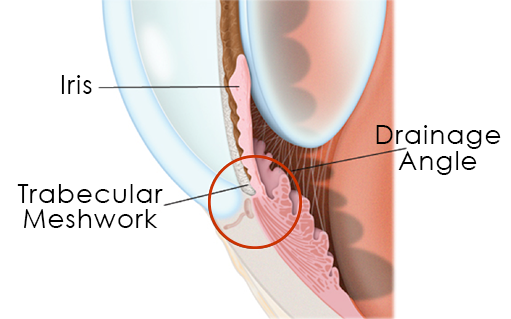 To circulate properly, aqueous humor should drain out of the eye through the drainage angle, the area where the cornea and iris meet, at an equal rate as the production of fluid. The trabecular meshwork is a sponge-like area of cells located in the drainage angle. The purpose of the trabecular meshwork is to regulate the flow of fluid to control the pressure in your eye, called intraocular pressure (IOP). With glaucoma, the aqueous humor fluid does not flow through the trabecular meshwork properly. Over time, this fluid builds up in the anterior chamber increasing eye pressure. High pressure causes damage to the optic nerve resulting in gradual vision loss. Glaucoma develops when the balance between the production and drainage of fluid is not regulated properly. Fluid pressure builds up inside the eye damaging the optic nerve and causing gradual and permanent vision loss. The reason aqueous humor cannot flow through the drainage angle efficiently depends on whether you have open-angle or closed-angle glaucoma. Most people with open-angle glaucoma have no symptoms and no early warning signs but if not diagnosed and treated, the condition can cause blindness. Primary open-angle glaucoma is the most common form of glaucoma in the United States. The “open-angle” indicates there are no clear signs of blockage in the drainage angle but aqueous humor is not flowing properly through the trabecular meshwork. When fluid is not draining at a sufficient pace, it is accumulating inside your eye increasing your eye pressure (IOP) and slowly damaging the optic nerve. If your IOP is not controlled, you will gradually lose vision, typically starting with your peripheral vision. Normal-tension glaucoma, also called low-tension or normal-pressure glaucoma, is a type of open-angle glaucoma where the optic nerve is damaged even though the eye pressure is within the “normal range” of less than 21 mm Hg. If you have closed-angle glaucoma it is best to avoid over-the-counter decongestants and medications that specify on the label not to use if you have glaucoma. Also known as acute or narrow-angle glaucoma, closed-angle glaucoma is less common and occurs when the iris partially or completely blocks the drainage angle of your eye. Unlike open-angle glaucoma where eye pressure increases gradually, eye pressure rises very quickly with this form. A closed-angle glaucoma acute attack occurs when the drainage angle becomes completely blocked and eye pressure gets too high requiring immediate medical attention. Open-angle glaucoma does not present any symptoms until the disease is quite advanced. You may notice blind spots in your vision or reduced peripheral vision. A glaucoma attack is a medical emergency and should be treated immediately. Tonometry: This test measures inner eye pressure, your IOP. The measurement may be taken without touching the eye with what is often referred to as the “air puff test,” or with a probe called a tonopen that gently flattens the cornea to measure your IOP. Normal eye pressure generally ranges between 10 and 21 mm Hg. Ophthalmoscopy: A drop enlarges or “dilates” your pupils allowing your eye doctor to see the shape and color of the optic nerve through an ophthalmoscope. Perimetry: A visual field machine checks for blank spots in your field of vision by mapping your response to a moving light. Gonioscopy: A mirrored lens allows your doctor to see the drainage angle between your iris and cornea to determine if it is open or closed. Pachymetry: A probe measures the thickness of your cornea. Optical coherence tomography (OCT) If your doctor suspects glaucoma, he or she may take high resolution pictures of the optic nerve using OCT. Much like an ultrasound uses sound waves for imaging, an OCT uses light waves to take three-dimensional images of your optic nerve. Your doctor may treat your glaucoma through prescription eye drops. These medications control your eye pressure by either reducing the amount of aqueous humor your eye produces or by improving the flow through the trabecular meshwork. Some patients may not tolerate the prescription medications or may opt to lessen their dependence on daily drops with selective laser trabeculoplasty (SLT). This in-office procedure using laser therapy makes tiny burns in the trabecular meshwork to stimulate more efficient flow of aqueous fluid through the drainage angle. Laser iridotomy treats closed-angle glaucoma by creating a small hole, about the size of a pinhole, in the top of the iris. This creates a new passageway to improve the flow of aqueous fluid through the drainage angle. Your ophthalmologist can often perform this procedure in the office. For more complicated forms of glaucoma, your surgeon may implant a drainage device. He or she stitches the implant on the outside of the sclera, the white part of your eye, where it serves as an artificial drainage device. The eye channels fluid to the implant where the fluid can absorb into the body instead of building up in the eye. Your ophthalmologist performs this procedure in an operating room. Currently, 120,000 Americans are blind from the “silent thief of sight.” Although there is no cure, the earlier the glaucoma is detected, the more vision will be saved. “Your life changes as you get older and some of your favorite activities become visual such as reading, vision-dependent hobbies, and watching tv. It’s very important to get screened, treated, and follow up to monitor progression. Early detection and treatment is key to preserving your vision!” says Dr. Parker. Even if you are seeing clearly and do not need contacts or glasses, you still need to be screened for your overall eye health! ^ “Eyes On Diabetes: Facts & Figures.” International Diabetes Federation, Web. Accessed May 2017. 1 “Eye Complications.” American Diabetes Association, Web. 2 “Facts About Diabetic Eye Disease: Who is at risk for diabetic retinopathy?.” National Eye Institute, Web. Sep 2015. 3 “Eye Care.” American Diabetes Association (ADA), Web. April 2015. 4 “What Is Diabetic Retinopathy.” American Academy of Ophthalmology (AAO), Web. Accessed May 2017. 5 “Glaucoma, Cataracts.” American Diabetes Association (ADA), Web. November 2013. 6 “Diabetic Retinopathy.” American Society of Retina Specialists (ASRS), Web. Accessed May 2017. 7 Diabetic Retinopathy: A Closer Look.. American Academy of Ophthalmology (AAO), Brochure. Copyright 2009. 8 “Healthy ABCs.” American Diabetes Association (ADA), Web. February 2015. 9 “IDF Diabetes Atlas: Seventh Edition.” International Diabetes Federation, Web. 2015. Other resources include: AAO, National Eye Institute.